As anyone familiar with the use of Oracle on Advanced Format storage devices will know to their cost, Oracle has had some difficulties implementing support of 4k devices. Officially, support for devices with a 4096 byte sector size was introduced in Oracle 11g Release 2 (see section 4.8.1.4 of the New Features Guide) but actually, if the truth be told, there were some holes. I should say at this point that most 4k Advanced Format storage products have the ability to offer 512 byte emulation, which means any of the problems shown here can be avoided with very little effort (or performance overhead), but since 4096 byte devices are widely expected to take over, it would be nice if Oracle could tighten up some of the problems. After all, it’s not just flash memory devices that tend to be 4k-based: Toshiba, HGST, Seagate and Western Digital are all making hard disk drives that use Advanced Format too. 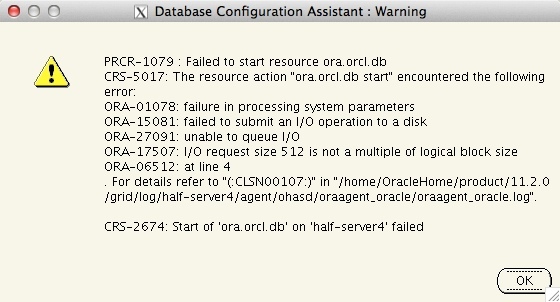 Given that 4k devices are allegedly supported in Oracle 11g Release 2 you would think it would make sense that you can provision a load of 4k LUNs and then install the Oracle Grid Infrastructure and Database software on them. But no, in versions up to and including 11.2.0.3 this caused a problem with the SPFILE. [root@half-server4 mapper]# fdisk -l /dev/mapper/slobdata1 | grep "Sector size"
Device "/dev/mapper/slobdata1" is marked an ASM disk with the label "SLOBDATA1"
[root@half-server4 mapper]# fdisk -l /dev/oracleasm/disks/SLOBDATA1 | grep "Sector size"
Time to install the database. I’ll just fire up the 11.2.0.3 OUI and install the database software complete with a default database, choosing to locate the database files in this +DATA diskgroup. What could possibly go wrong?
. 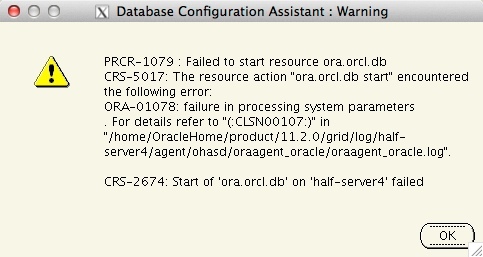 For details refer to "(:CLSN00107:)" in "/home/OracleHome/product/11.2.0/grid/log/half-server4/agent/ohasd/oraagent_oracle/oraagent_oracle.log". At the time of writing, this bug is shown as fixed in 11.2.0.4 and the 12.2 forward code stream, with backports available for 11.2.0.2.0, 11.2.0.3.0, 11.2.0.3.7, 12.1.0.1.0 and 12.1.0.1.2. Alternatively, there is the simple workaround (documented in my Install Cookbooks) of placing the SPFILE in a non-4k location. What the heck, I have the 11.2.0.4 binaries stored locally, so let’s fire it up and see the fixed SPFILE in action. As with the previous example, I have a set of 4k LUNs presented via ASMLib – I won’t repeat the output from above as it’s identical. The ASM diskgroup correctly shows the sector size as 4096, so we’re ready to install the database software and let it create a database. As before the database files will be located in the diskgroup – including the SPFILE – but this time, it won’t fail because bug 14626924 is fixed in 11.2.0.4 right? Right? This looks very similar. Unfortunately this bug is marked as a duplicate of base bug 18016679, which sadly is unpublished. All we know about it is that, at the time of writing, it isn’t fixed – the status of the duplicate is still “Waiting for the base bug fix“. I kind of had a feeling that the above problem was in some way related to the use of ASMLib, so I thought I’d repeat the entire 11.2.0.4 install using normal block devices. Essentially this means changing the ASM discovery path from it’s default value of ‘ORCL:*’ to the path of the device mapper multipath devices, which is my case is ‘/dev/mapper/slob*’.